At the end of the last update, I had just finished testing out the mower for the first time. I found that just driving the mower around doesn’t take much power, but the mowing deck was taking a ton of power. So, I asked for help on the forum here and at the local EV (electric vehicle) club that I’m a member of. 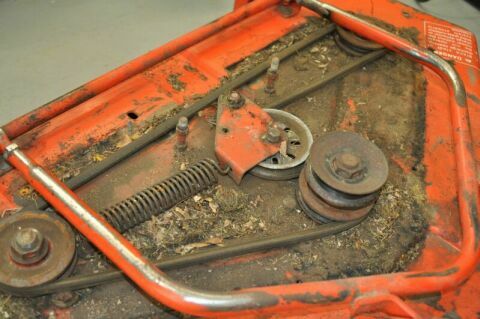 The guys suggested that I take a look at the mowing deck and make sure that it was in good condition and there wasn’t any binding or bad bearings stealing my power. As it turns out, the deck wasn’t in horrible shape, but some attention and a rebuild definitely couldn’t hurt. It was completely packed full of grass around the pulleys. So, the first step was cleaning it up. The picture above is after I removed the initial huge clumps of dead grass, and given it a fair cleaning. It was pretty caked full of stuff. I also looked at the bearings. It looked like they hadn’t been greased in quite some time. I spun a few of the mower blades and two of the three didn’t make the greatest noise. This meant it was time for new bearings. 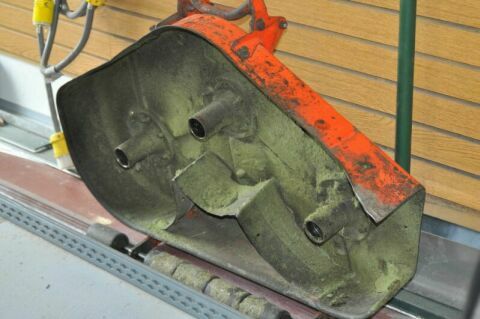 By and far, this is t he most expensive part of the mower yet. 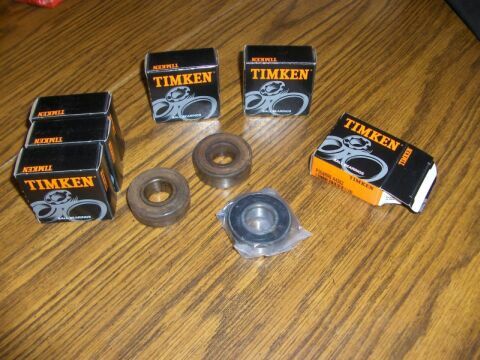 I went ahead and got high quality Timken bearings from the local bearing supply place. However, I was assured by the salesman that these bearings will probably outlast me, and they also don’t require greasing like the old style. This was worth it to me. So, the next step was to start rebuilding the deck. It was disassembled, and the bearings were replaced. I also took the time to sharpen the blades while they were off the mower. Then, it was put back together. A pretty simple process that was only a bit of a pain. 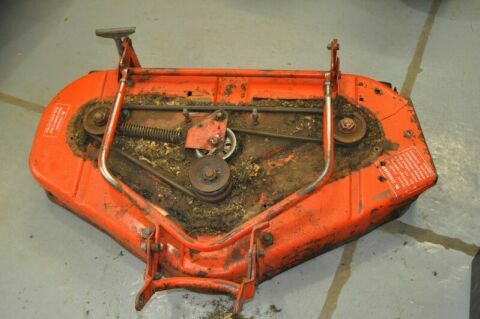 With the mower deck rebuilt, I can do testing to see what good the rebuild did.